This completely renovated villa has a private mooring of 15m It consists of a living - dining room, a fully equipped kitchen, 4 double bedrooms, 5 bathrooms with toilets, terraces, swimming pool. Extra's: interior lift, parking, garage, ..
Maison avec piscine et grand garage, orientation Sud. Maison plein sud dans une impasse calme près de commerces, avec garage separé, jardín et piscine neuve. Elle est vendue avec salon, salle à manger et cuisine à l’americaine .. Luxury villa located in Palau Saverdera and a beautiful view of the Bay of Roses It consists of a living room - dining room, 1 fully equipped kitchen, 4 bedrooms, 4 bathrooms, 1 separate toilet, terrace, .. This beautiful villa renovated in 2015 will meet all your expectations! Ground floor: 1 living room - dining room, 1 fully equipped American kitchen, terrace, pool and mooring 13m 1st floor: 5 en suite bedrooms with bathrooms .. Luxury villa on the canal with a mooring of 12.50m It consists of a living room - dining room, 1 fully equipped kitchen, 6 en suite bedrooms, 6 bathrooms with wc, garden, terrace, summer kitchen, swimming .. 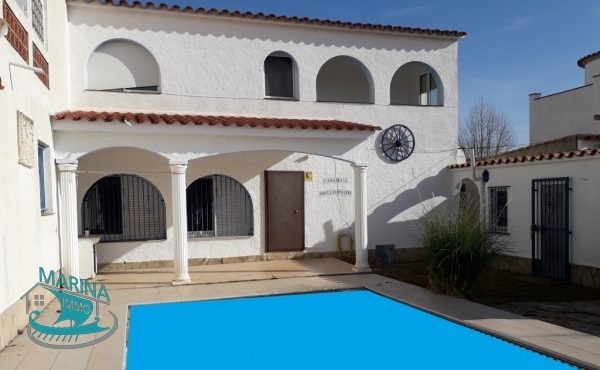 This villa is located on the wide canal of Empuriabrava with a mooring of 10m It is built on 2 levels: ground floor: 1 living room - dining room, 1 fully equipped kitchen, 1 double bedroom, 1 ..